Crossroads: The Music of American Cultures by Elizabeth F. Barkley is a digital, interactive textbook designed for today’s more diverse students to promote active and engaged learning. Requiring no prior music knowledge, it traces the development of genres such as jazz, blues, Gospel, Cajun, Zydeco, Tejano, Banda, salsa, Rock ‘n’ Roll, Motown, Soul, Funk, Urban Folk, Country, Reggae, Hip Hop and Rap from their origins in immigrant traditions to their development into uniquely American musics that have gone on to impact the world. 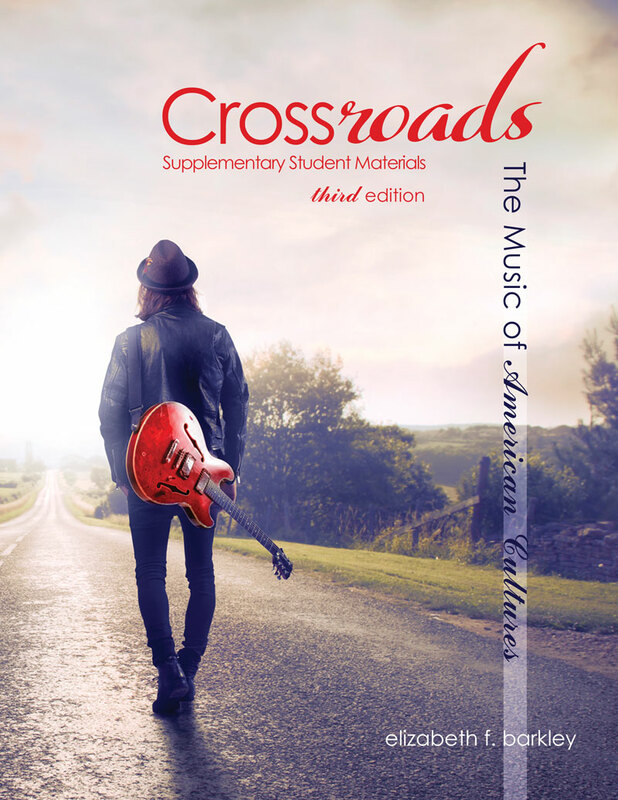 Crossroads: The Music of American Cultures explores these genres’ history, structural characteristics, stylistic categories, and key musicians using 400 carefully selected listening examples from the extensive Napster/Rhapsody digital library of more than ten million selections. Is an interactive, visually-appealing package that promotes active learning and greater retention by presenting material ‘chunked’ rather than linear like traditional print textbooks. Integrates 400 listening examples including Grammy Award winners. Features seven components for each chapter, including Preview Questions, Chapter Narrative, Music Listening Guide, Review Flashcards, Chapter Quizzes, Discussion Forum, and Reflection Questions. Includes Supplementary Student Materials such as Chapter-Specific Student Learning Outcomes, Chart of Additional Resources, and Student-to-Student Tips. Elizabeth F. Barkley, Ph.D. is Professor of Music History at Foothill College, Los Altos, California. With four decades as an innovative and reflective teacher, she has received numerous honors and awards, including being named California's Higher Education Professor of the Year by the Carnegie Foundation for the Advancement of Teaching, formally recognized by the California state legislature for her contributions to undergraduate education, selected as "Innovator of the Year" in conjunction with the National League for Innovation, presented with the Hayward Award for Educational Excellence, and honored by the Center for Diversity in Teaching and Learning in Higher Education. Additionally, her Musics of Multicultural America course was selected as “Best Online Course” by the California Virtual Campus, and she was named one of two Carnegie Scholars in the discipline of music by the Carnegie Foundation in conjunction with the Pew Charitable Trusts. A popular keynote speaker and workshop presenter, her interests include engaging students through active and collaborative learning; transforming F2F and online curriculum to meet the needs of diverse learners; the scholarship of teaching and learning; and connecting learning goals with assessment. Barkley holds a B.A. and M.A. from University of California, Riverside and a Ph.D. from University of California, Berkeley. Her books have been translated into multiple languages and include, Interactive Lecturing (co-authored with Claire H. Major, Wiley/Jossey-Bass, 2018), Learning Assessment Techniques (co-authored with Claire H. Major, Wiley/Jossey-Bass, 2016), Collaborative Learning Techniques (co-authored with Claire H. Major and K. Patricia Cross, Wiley/Jossey-Bass, Second Edition, 2014), Student Engagement Techniques (Wiley/Jossey-Bass, 2010), Crossroads: The Roots of America's Popular Music (Prentice Hall, 2nd Edition, 2007), and two additional interactive digital textbooks for Kendall Hunt in conjunction with Great River Learning: World Music: Roots to Contemporary Global Fusions (2012), and Great Composers and Music Masterpieces of Western Civilization (co-authored with Robert Hartwell, 2015).